LTC Stuart A. Luttrell, United States Army, 52, of Stuttgart, Germany/Bentonville, AR, went to be with His Lord and Savior Jesus Christ, Thursday, January 31, 2019 in Stuttgart Germany. He was born December 13, 1966 in Fayetteville, AR, to Mr. and Mrs. Arnold Luttrell (Jeannie) of Bentonville, AR, who raised him in the faith of Church of Christ (Bentonville) and that is where he was baptized. Stuart led his life entrenched in his love of his faith, family and service to his country. Stuart was beloved husband to Lisa C. Luttrell Stuttgart, Germany/Bentonville, AR and devoted father to their children, Stuart Andrew Luttrell, Jr. (21), Arkansas Tech University, Natalie K. Luttrell (19), Kansas State University , and Lance S. Luttrell (16), Stuttgart High School, Germany. He was cherished brother to Robyn L. Nelson (Edwin) of Cave Springs, AR, Kimberly Luttrell Alexander of Bentonville, AR and Jeremy D. Luttrell (Kaylee) of Bentonville, AR. Stuart was a treasured brother-in-law, uncle, nephew and cousin to many in the Northwest Arkansas region and beyond. 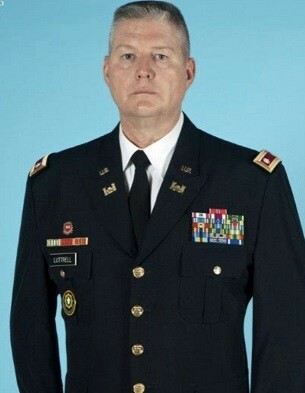 Stuart was a 1990 graduate of Arkansas Tech University, Russellville, AR with a Bachelor’s of Science degree in Economics and Member of the Kappa Alpha Order as well as a 2010 graduate of The United States Army Command and General Staff College, Fort Leavenworth, KS with a Master’s in Strategy. LTC Luttrell began his military career over 32 years ago as both an Arkansas Army National Guardsman and Missouri Army National Guardsman and was presently serving as an Active Component United States Army Officer in the capacity of Branch Chief of J5 Plans, United States Africa Command (AFRICOM) located in Stuttgart, Germany. LTC Luttrell’s worldwide deployments included but were not limited to Iraq, Bosnia/Herzegovina/Kosovo, South Korea and Germany. His military awards as an Officer included: Legion of Merit Medal (1), Bronze Star Medal awarded (1), Defense Meritorious Service Medal (2), Meritorious Service Medal (1), Army Commendation Medal (3), Joint Service Achievement Medal (1), Army Achievement Medal (2), Presidential Unit Citation (1), Joint Meritorious Unit Award (2), Meritorious Unit Commendation (1), Army Superior Unit Award (1), Army Reserve Components Achievement Medal (3), National Defense Service Ribbon (1), National Defense Service Medal (2), Armed Forces Expeditionary Medal (1), Global War on Terrorism (1), Global War on Terrorism Service Medal (2), Korea Defense Service Medal (1), Armed Forces Service Service Medal (1), Humanitarian Service Medal (1), Armed Forces Reserve Medal (1), Army Service Ribbon (1), Army Overseas Service Ribbon (2) Army Reserve Components Overseas Training Ribbon (6), Armed Forces Reserve Medal (1) and the NATO Commendation Medal (1). Funeral services and burial will be held graveside with full military honors at 1:00PM, Friday, February 15, 2019 at the Fayetteville National Cemetery, located at 700 S.Government Ave, Fayetteville, AR 72701.